The first production I am reviewing in this year’s Acts of Faith Festival is The Joshua Plant. 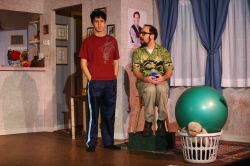 CAT Theatre’s production marks the first full performance of this original work by local playwrights Amy Berlin and P. Ann Bucci. As a special education teacher, this play is truly special to me, for its story revolves around Joshua, a teen with autism. Joshua is non-verbal, except for his internal conversations that he holds with Sid, a house plant (Joshua’s plant). 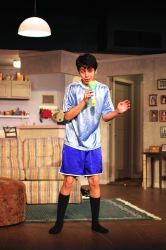 Diego Salinas goes beyond authentic in his performance. He realistically touches all the nuances of sensory overload, self stimulatory and ritualistic behaviors, facial tics, toe walking and avoidance of physical contact. CAT Theatre worked closely with the nearby Dominion School and director Laurie Follmer’s resulting work with Salinas is extraordinary. The differentiation Salinas displays in his character when he is “autistic” versus when he is “normal” in his conversations with Sid is remarkable. He not only shows a range of emotions; but does a pretty good Seinfeld impression. Aaron Orensky is also masterful as Sid the plant. He uses his voice, energy, timing and facial characteristics to command the stage and bring to life a character who can not move from one spot. 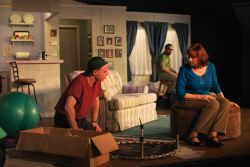 The cast is skillfully rounded out by Rebekah Spence, as Joshua’s harrowed and overwhelmed single mother; Kathy Parker as her supportive and caring friend and Tim Gettemy as Joshua’s mother’s boyfriend. Spence balances Sandy’s love and optimism in hoping to reach her son with pain and raw emotion. Parker is spunky, down to earth and strong as the kind of friend and neighbor we’d all like to have and Gettemy is narcissistic and twisted as the alcoholic boyfriend. My only complaint was at times Jimmy came across as almost just a bit likeable and empathetic, but this was erased in the darker moments. 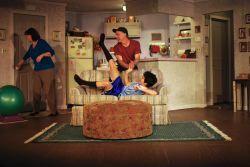 Lin Heath’s set design works to create the condo of Sandy and Joshua that is half living space and have special education/Occupational Therapy space. Alan Armstrong’s lights also help create the mood and time. Berlin and Bucci have created an emotionally poignant and disarming presentation of what life must be like inside the mind of a child with autism and why they might do the things they do. As both a reviewer and a special educator I truly hope everyone who hears about The Joshua Plant gets the opportunity to experience this special work. Disclaimer: CAT Theatre provided two complimentary media tickets to ShowBizRadio for this review. Playwright Amy Berlin writes for ShowBizRadio. This article can be linked to as: http://showbizradio.com/go/9899.